This is the result, apparently, of hybridization between L. tatarica and L. morrowii, and is established in the same habitats as the parents. It was first collected in 1915 (in St. Clair and Wayne Cos.), well before the first record of L. morrowii as an escape. It has arisen in cultivation and probably spontaneously in the wild as well. Lonicera ×bella is a name applied to a swarm of variants and is distinguished principally by the combination of pubescence and very short bracteoles (see comments under L. tatarica). Corollas are colored as in L. tatarica from deep pink to white, but fade to a dull yellow as in L. morrowii. There seems to be no sharp line of separation from L. morrowii in either density of pubescence or length of bracteoles, and intermediate specimens are frequent. Because the hybrid is so common and may occur without either parent, it is keyed and mapped here to show its documented distribution (doubtless understating its abundance). A few individuals of intermediate nature may be of other parentage. Small corollas (less than 12 mm long) and/or somewhat obovate blades could derive from L. ×bella × L. ruprechtiana Regel (L. ×muendeniensis Rehder). 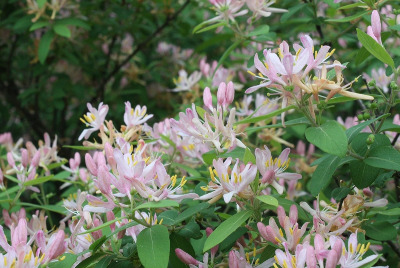 Swink and Wilhelm (1994) treat the messy hybrid shrub honeysuckle complex in more detail. MICHIGAN FLORA ONLINE. A. A. Reznicek, E. G. Voss, & B. S. Walters. February 2011. University of Michigan. Web. April 19, 2019. https://michiganflora.net/species.aspx?id=729.